The prints in this section were included to illustrate Yolanda del Riego’s (YR) first steps into printmaking. Most of them were created in the many in-depth workshops with visiting artists at the Visual Arts Center of Alaska during the mid-1970s. Drypoint was one of the first printmaking technique YR learned. The work Slope was created during the workshop Relief Printmaking and Modern Printmaking taught by Carol Summers in 1976. 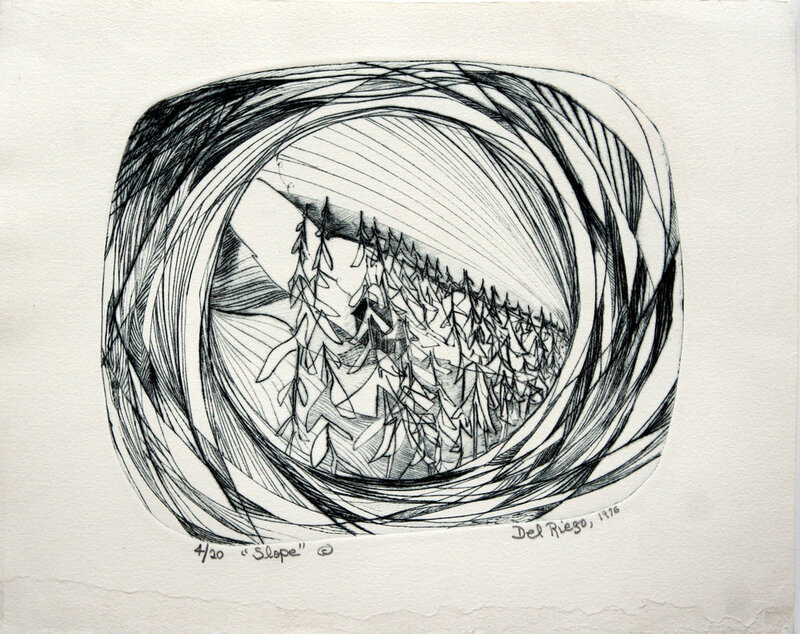 In 1977, YR traveled to Fairbanks to attend a workshop with Dr. Jules Heller, Intaglio and Mixed Printmaking Techniques, at the University of Alaska in Fairbanks. Many of the techniques she learned during that workshop, such as à la poupée printing, intaglio printed relief and soft ground etching, were to become staples of her future printmaking works. They can also be seen in the work Reflecting on Glacier Waters, created shortly afterwards. YR was first exposed to papermaking with Dr. Jules Heller (author of the book Papermaking). One of her first works on paper handmade by her was the blind embossing Bread Basket. 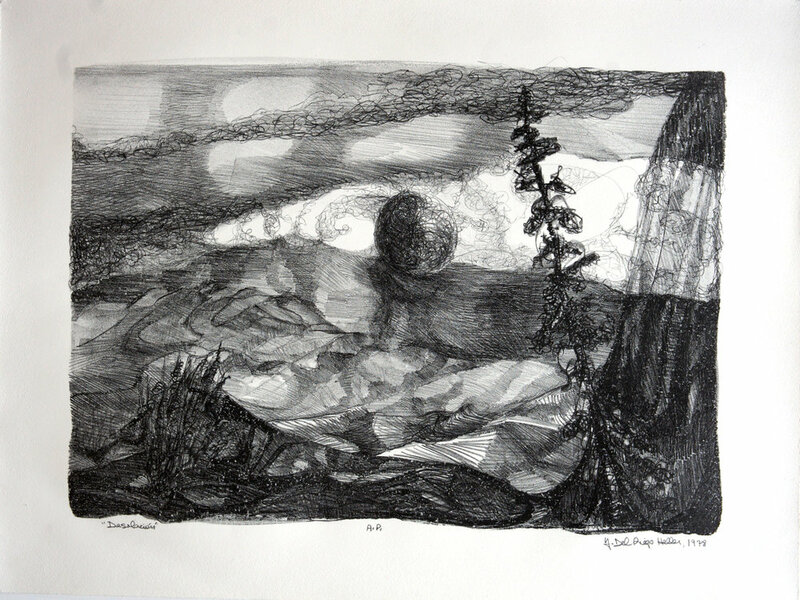 The work Glacier Lake resulted from the workshop Intaglio and chine-collé, taught by Misch Kohn (Professor, California State University-Hayward). Complete freedom in the structuring of compositions and the use of mixed techniques, unbound by traditional conventions, was one of the key lessons that YR learned from Misch Kohn. In 1977, YR participated in two lithography workshops: one taught by Bob Evermon (Professor, Vancouver School of Art) and the other by John Sommers (Technical Director of the Tamarind Institute). The lithography Desolation was created following these workshops .